Author: Emilio Gadda, Carlo Set In . . . Description: In a large apartment house in central Rome, two crimes are committed within a matter of days: a burglary, in which a good deal of money and precious jewels are taken, and a murder, as a young woman whose husband is out of town is found with her throat cut. Called in to investigate, melancholy Detective Ciccio, a secret admirer of the murdered woman and a friend of her husband’s, discovers that almost everyone in the apartment building is somehow involved in the case, and with each new development the mystery only deepens and broadens. 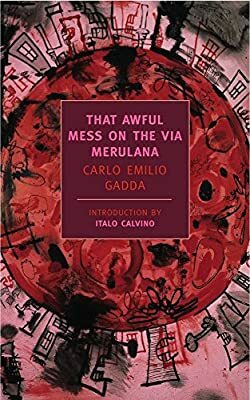 Gadda’s sublimely different detective story presents a scathing picture of fascist Italy while tracking the elusiveness of the truth, the impossibility of proof, and the infinite complexity of the workings of fate, showing how they come into conflict with the demands of justice and love. Italo Calvino, Pier Paolo Pasolini, and Alberto Moravia all considered That Awful Mess on the Via Merulana to be the great modern Italian novel. Unquestionably, it is a work of universal significance and protean genius: a rich social novel, a comic opera, an act of political resistance, a blazing feat of baroque wordplay, and a haunting story of life and death.